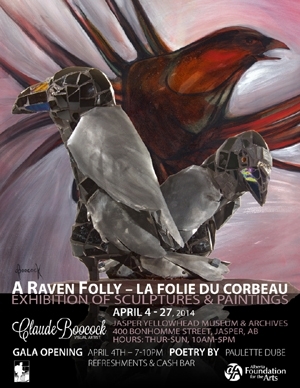 Our Showcase Gallery (750 sq ft) exhibits change throughout the year. Some of our past summer exhibits include Outfitters and Guides of the Glittering Mountains, Bears in the Alley and David Thompson 200 Years Later. During the rest of the year we feature exhibits by local artisans and photographers, travelling historical exhibits and special displays like our ever popular Festival of Trees. 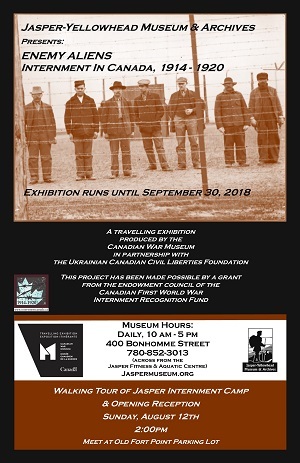 The Jasper-Yellowhead Museum & Archives gratefully acknowledges the financial support of the Alberta Museums Association that funds our Exhibits Designer & Coordinator position. 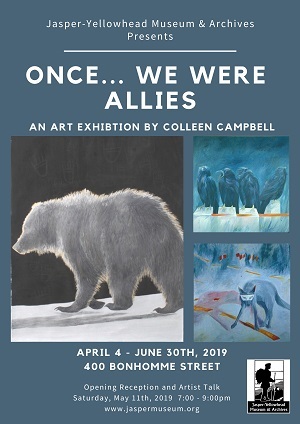 Colleen's exhibition is a collection of wildlife images of bears, coyotes and ravens. Beyond physical depiction, Colleen’s drawings are metaphors of the metaphysical status held by each of the three particular species, and of various stories about them. (Dorothy) Joan (1906 - 2001) was a self-taught botanist and talented watercolour painter. She was an avid outdoorswoman and pressed many of the flowers she found in her travels. In 1967, she was granted a rare, official dispensation to pick the flowers in a National Park (Jasper). 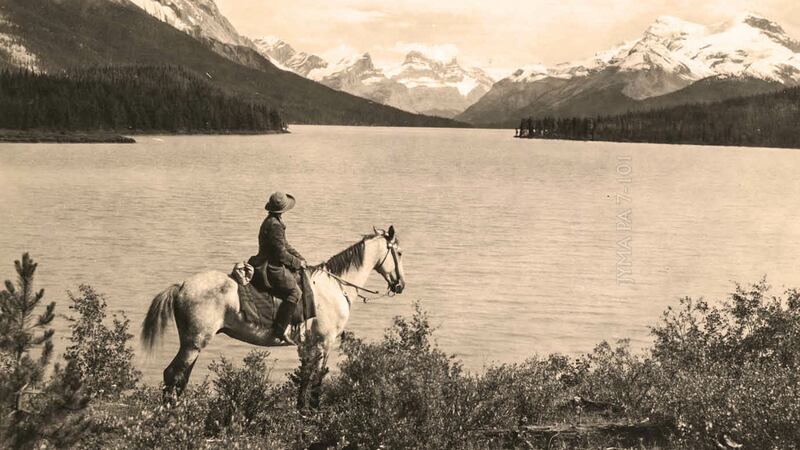 In July 1927, Joan was a member of the Jack Brewster pack horse trip on the Glacier Trail, from Jasper to the Columbia Icefields, before the road was built. 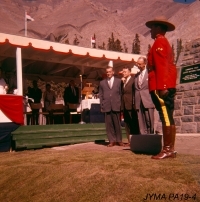 Joan later worked for the Imperial Bank in Jasper and for the Parks Canada Commission. The Robson family home was moved from its original location to the 400 block of Patricia where it is currently used as the office for the Jasper Chamber of Commerce. 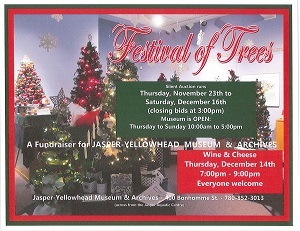 Joan’s watercolors and other early images as well as the flowers that she picked in 1967 were donated to the Jasper-Yellowhead Museum & Archives in 1993. Every year local residences, businesses and other non-profit organizations generously support us by decorating themed trees, wreaths, art and other interesting displays that make up this magical display. when the bids close at 3 pm. Our extra special Wine and Cheese event is being held on Thursday, December 6th from 7:00pm to 9:00pm. Everyone is welcome and Admission is FREE. The museum is open Thursday - Sunday 10-5 pm and there is no charge to enter the Festival of Trees or to shop in our wonderful Gift Shop. Join Destanne Norris who will share her artistic practice and life through a visual presentation: her story includes her beginning as an undergraduate BFA student to pursuing an international MFA degree in Australia, her art and life in between and after. 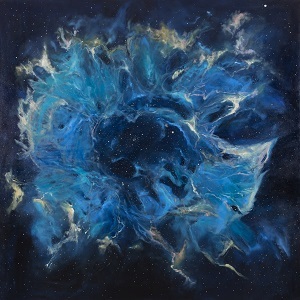 Culminating in her most recently body of work – paintings of the Cosmos – exhibited in Stellar: Grounded in the Dark Night Sky. Destanne illuminates her perspective on the relationship between art and astronomy, as well as it’s interconnection with our humanity. As the British Empire went to war in 1914, thousands of newly - arrived European immigrants to Canada fell under suspicion as citizens of enemy empires. National security fears and wartime prejudice drove the policy of internment, which lasted until 1920. During this time, Canada interned 8,579 men identified as enemy aliens, mainly Ukrainian and German immigrants, across a network of 24 camps. Now, 100 years later, using photographs drawn from Canadian archival collections, Enemy Aliens – Internment in Canada, 1914–1920 explores internment operations and the experiences of the internees: who they were, the conditions they endured, and the legacy they left behind. 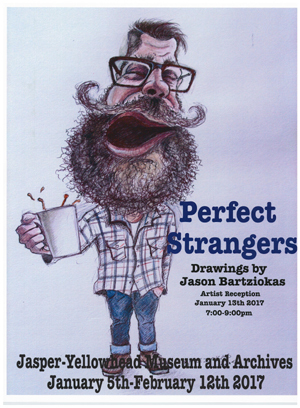 Where we will be featuring a very special guest Marsha Skrypuch. Marsha is a very renowned speaker and author who has written over 22 books and children’s books on the topic of internment. 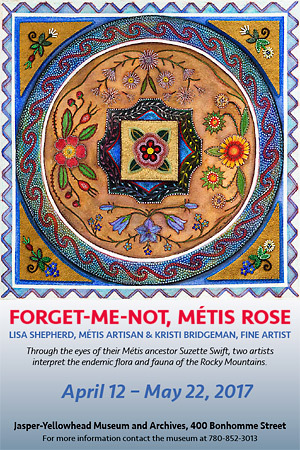 Marsha will be doing a reading from one of her books and we will be joined by a representative from the Canadian War Museum in Ottawa and a representative from the Endowment Council of the Canadian First World War Internment Recognition Fund who provided a grant for us to bring in this special exhibition. Admission is FREE but donations graciously accepted. 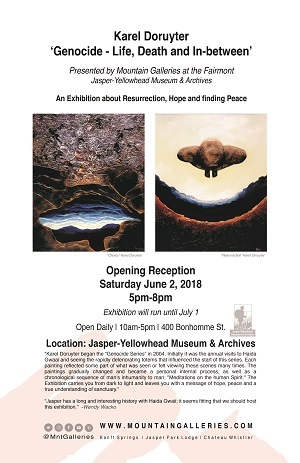 An exhibition about Resurrection, Hope and finding Peace. 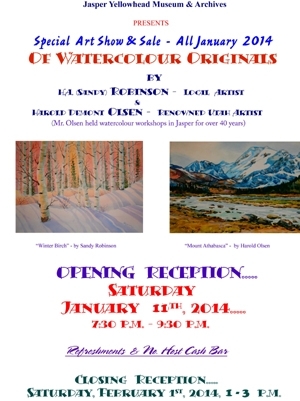 The Jasper-Yellowhead Museum & Archives are once again proud to host the artists of Lake Edith. 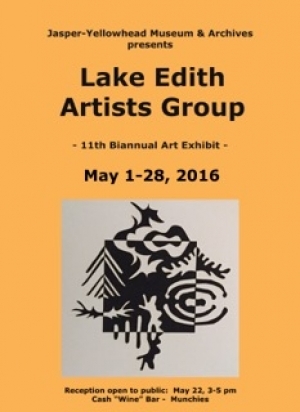 For the past 22 years the Lake Edith artists have presented their work bi-annually in our gallery. 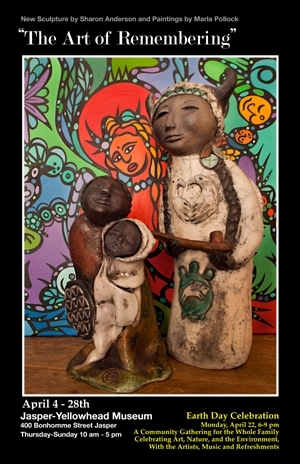 Their artwork is representative of the surrounding landscape and animals in the environment through painting, sculpture, photography and textile art forms. 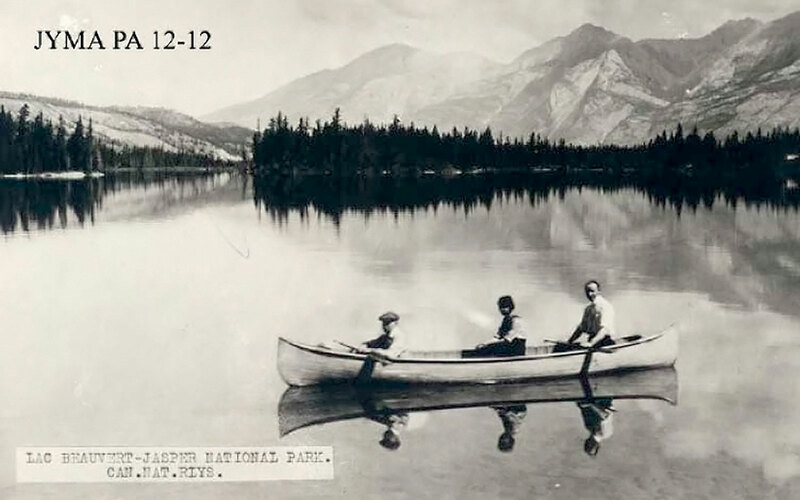 The Sub-division of Lake Edith was conceived by Agnes Laut in the 1920's when she petitioned the Federal Government for 10 lots so that writers and artists could establish a community to foster their representation of the Park. Some of the original cabins are still in use and many have been passed down through multiple generations. The artistic history of Lake Edith influenced many residents to train formally as artists at University or Art Colleges, or informally develop their artwork by attending workshops and maintaining a vigorous practise. 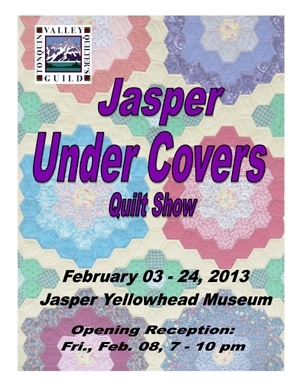 Features two exhibitions, Secret No Longer: Mary Schäffer’s Jasper, 1908 and 1911 and This Wild Spirit: Women in the Rocky Mountains of Canada. When viewed together, these shows foster deeper insight into Mary Schäffer’s photographic legacy in Jasper and its place among women’s creative practices in the Canadian Rockies. 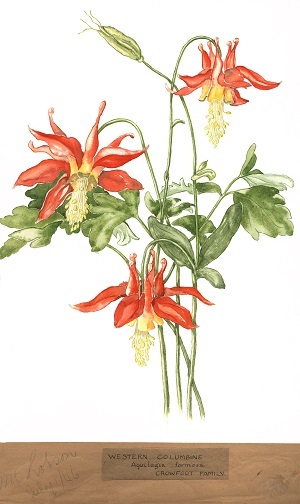 Mary Schäffer was a photographer, writer, and botanical painter from Philadelphia who garnered an international reputation for her images, books, and mountain journeys in 1907, 1908, and 1911 to find and map Maligne Lake. And yet, she was not a lone adventurer off the beaten tracks of the railway and its tourist amenities. She worked within a diverse web of women who made significant contributions to Rocky Mountain histories and cultures, both in Schäffer’s day and afterwards. Every year local residences, businesses and other non-profit organizations generously support us by decorating or bidding on themed trees, wreaths, quilts and other interesting displays that make up this magical display. Something new this year, is a chance for you to vote on your favorite tree or item. All votes will then be entered into a draw for a chance to win dinner for 2 at any of the Mountain Park Lodges Restaurants in Jasper courtesy of Dana Hospitality and Mountain Park Lodges. A $75.00 value. Enter as many times as you like but only one vote per museum visit please. Our extra special Wine and Cheese event is being held on Thursday, December 14th from 7:00pm to 9:00pm. Everyone is welcome and Admission is FREE. From 1920 - 1927 over 500,000 railroad ties were cut in the Whirlpool Valley in the Athabasca Pass and floated down the Athabasca River through Jasper National Park. 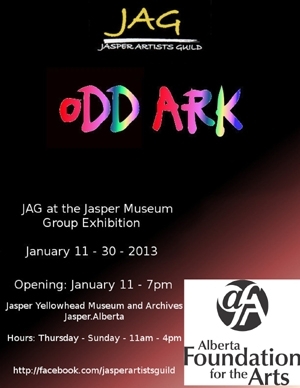 Come and learn about this very little known history that took place in Jasper National Park. 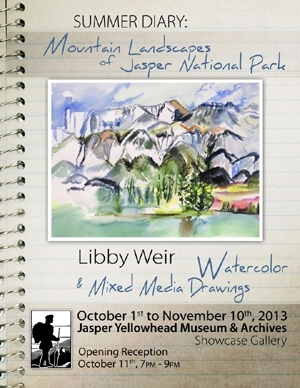 The show consists of drawings created over the past year and chronicles visitors to Jasper, National Park. 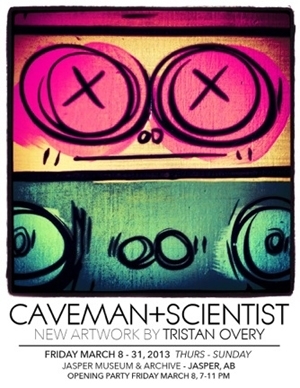 I really wanted to construct a body of work that was free from expectation and therefore, allowed complete creative freedom. When you don't know your subject, reality and imagination can merge without worrying someone will be offended. 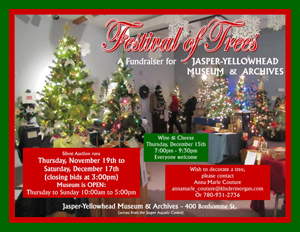 Every year generous Jasperites support us by decorating or bidding on the trees and wreaths that make up this magical display. Our extra special Wine and Cheese event is December 15th from 7 to 9:30 pm. Everyone is welcome. The museum is open Thursday-Sunday 10-5 pm and there is no charge to enter the Festival of Trees or to shop in our wonderful gift shop. 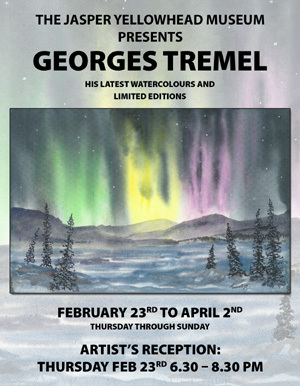 This exhibit will appeal to people who are interested in glaciers, trees and scientific research-especially people who have been to or are planning to visit the Columbia Icefield or Mount Edith Cavell area. 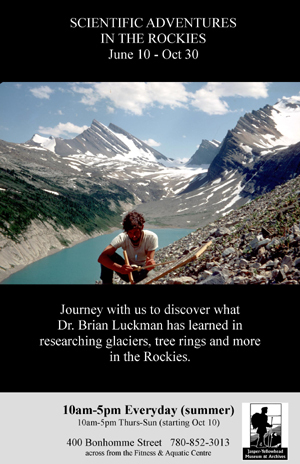 Dr. Brian Luckman and his students have studied glaciers and tree rings in the Rockies for more than 40 years. This exhibit shares their adventures as they uncover the mysteries of glaciers and their movements over many years. You will learn about tree rings and the stories they tell and discover what adventures can be had when trying to conduct research in remote wilderness areas. You’ll come to understand why Dr. Luckman sees this park as a teaching laboratory where people can see and understand the landscape and its history. 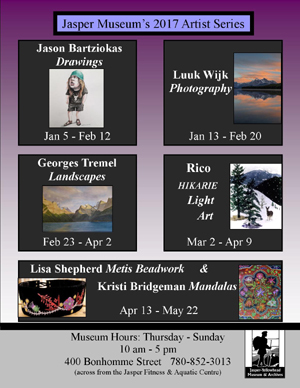 "Summer's Past" exhibit featuring the 90th Anniversary of the Golf Course, the 75th Anniversary of the Icefields Parkway, and other summer activities enjoyed by visitors over the past few decades! 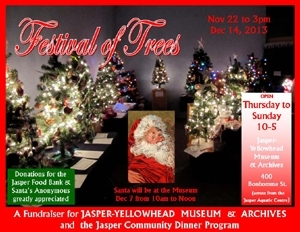 Donations for the Jasper Food Bank and Santa's Anonymous will be accepted at the museum throughout this event. Join us on Decmber 7th when Santa will visit from 10 am until noon. 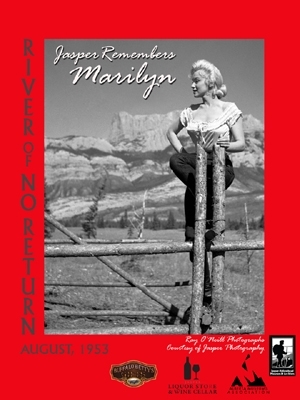 In 1953 Marilyn Monroe was in Jasper to shoot River of No Return. 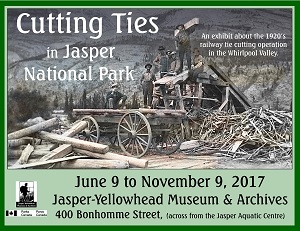 This exhibit features Jasper residents' memories of that special summer complemented by personal snapshots and the classic images of local photographer, Ray O’Neill.